1. Apply sesame oil on your cracked heels before sleeping in the night. It is a best home remedy for cracked heels. 2. Daily apply a mixture of rosewater and glycerin. It soothes your heels and cures them fast. 3. Squeeze one lemon in a ¼ bucket of water, soak your feet weekly twice and wash your feet using pumice stone and soap. 4. Massage your heels with coconut oil before going to bed in the night. Scrub properly and rinse off in the morning. 5. Mix papaya and lemon juice, apply on the affected area and wash off after 20 minutes. 6. Soak your feet in warm water with a little soap in it for 15 minutes, it loosens the dry skin and wash off using pumice stone. 7. Apply a foot cream especially designed for treating cracked heels before sleep in the night and wash off using a pumice stone in the morning. 8. Apply the pulp of a ripe banana on the affected area, leave it for 10 to 15 minutes and wash it properly. It helps in fast healing. 9. If your cracks are causing pain, try this home remedy to heal it fast. Melt little paraffin wax, add coconut oil to it, fill the cracks with the mixture before sleeping in the night and wash off in the morning. Try it for 1 to 2 weeks for best results. 10. Apply vaseline or paraffin oil or petroleum jelly or hydrogenated vegetable oil on your heels after washing your feet clean i.e. after doing any of the above procedures. This helps your feet to recover to its normal condition. 1. Avoid wearing thin soled or backed shoes if you are developing cracked heels. 2. Use pumice stone on your heels thrice a week to remove the dead skin from your heels. 3. Moisturize your heels twice daily. It helps to get rid of cracked heels fast. 4. Drink lots of water to keep your skin hydrated. It keeps your skin soft and supple preventing dryness of skin that results in cracks. 5. Always keep your feet clean and wash it properly whenever you come from outside. 6. Give a foot massage and foot bath to your feet thrice a week that keeps the surrounding skin soft and healthy. 7. If your cracks are causing pain, wear shoes that are comfortable and soft to your feet. 8. 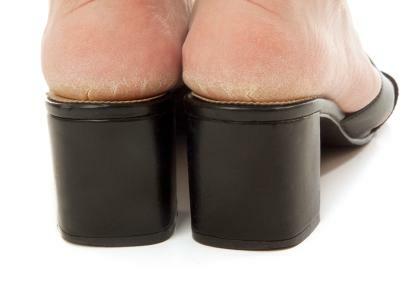 Cracked heels may be sign of zinc and omega-3 fatty acids deficiency in your body. So add them in your daily diet. I have to make a comment. We have been brainwashed by the media in thinking that exercise and a healthy diet is the miracle cure for everything these days! Never have there been more sick people in this world then today! I have been slim all my life and had dry feet, despite drinking a lot of water every day and trying most of the above. I am not implying they don't work but it's not always a simple case of being or eating the perfect things. I agree with the comment from anonymous above. I have had this problem for years and tried so many of these home remedies with very little results that ever lasted more than a few days. Most of the cronic cracks are actually a foot fungus similar to athletes foot. I agree that these remedies are great for exfoliation but without treating the area with an anti fungal cream to kill the problem at its source it will never truly go away.